My roommate recently went to visit her brother in Switzerland. While she was there she ventured over to Italy and was nice enough to get me an authentic Italian cook book. To thank her for the cook book, I told her I would cook her a recipe out of it. I spent hours reading over all of the unique Italian recipes. Eventually, we decided on Falsomagro. I had never even heard of Falsomagro before seeing it in this book. Vegetarians beware… Falsomagro is a protein loaded Italian meat dinner from Sicily. 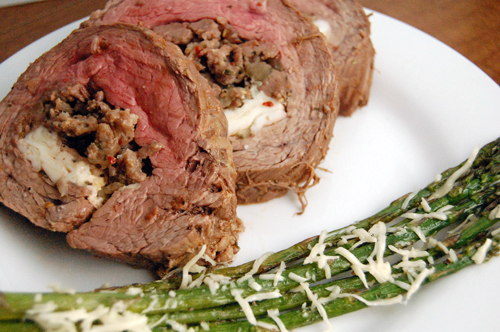 It is a large flank steak filled with bacon, Italian sausage, eggs and cheese, then rolled up and slow cooked. I am 100% a meat eater, so I was pretty excited about packing as many proteins as possible into a big hunk of beef. I was a bit worried about cooking the meat for so long; I thought it was going to end up over-cooked, but it ended up being surprisingly tender! This is a great meal for a dinner party; it serves a lot of people and is very filling. I served my Falsomagro with parmesan roasted asparagus and potatoes.